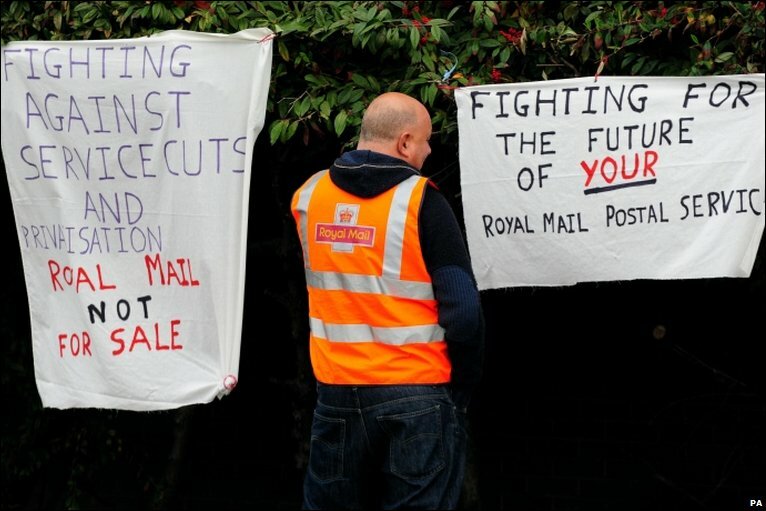 Postal workers at Royal Mail’s Coventry North Delivery Office will be taking 24 hours of strike action onTuesday 27th August. Over 80% of the 200+ workers (members of the Communication Workers’ Union, CWU), voted in favour of a oneday strike to warn the local management that enough is enough, regarding the way the office is being run and the way workers are being treated. Over several months now, the local management have refused to follow national agreements; there is bullying/harassment of certain workers; and they make executive decisions daily to increase our workloads,regardless of the amount of mail coming into the office each day. Usually based on some opaque figures relating to mail traffic volumes. They call this ‘lapsing and absorbing’ and its been going on for years. It used to be that we’d do this only on days where mail volumes were low, usually just Tuesdays and only over the summer period. What happens is that at least one round (occasionally two) in each post code area is left vacant that day, due to the postie’s day off, annual leave etc. Then the rest of the workers in that area would prep and deliver that round that day, after doing their own round. IF you had time. Then Mondays were included, which continued for a couple of years and again, only if you had the time after doing your own job. Then, several months ago our local management insisted we had to ‘absorb’ at least one job every day. And if you say that you don’t think you will have the time (because you’re snowed under with your own job), that’s when the intimidation and threats begin. As a worker on the ‘shop floor’, it appears to me that the culture of management in Royal Mail today is to encourage managers to be confrontational, even intimidating. And certain managers really relish every opportunity to show the workforce ‘who’s boss’. Indeed such is the scale of bullying and harassment in Royal Mail, that they, along with the CWU, had to agree a national joint statement on the issue. I guess £400+ million profits this year just isn’t enough for some people! But its the people at the bottom, the postmen and women, who pay the price through stress related illnesses, physical injuries due to over-work and fatigue, worse terms and conditions and ultimately job cuts, as the privatisation of Royal Mail looms. Because things will only get worse if Royal Mail is privatised. All 3 main parties support some form of privatisation of Royal Mail. But the public have shown, in surveyafter survey, that they oppose it. We Royal Mail workers need to take industrial action to stop the attacks locally. And we also need to take national action against privatising this public service, one which is doing just fine in the public sector. We also need to link up with other workers in other unions who are in dispute, and look to co-ordinate any action with them. We all own Royal Mail at the moment. And we workers are proud to provide a 6 day delivery service to 29 million addresses throughout the UK. We can’t let it fall into the hands of a few privateers looking to run the service down in pursuit of a fast buck. For a publicly owned postal service. Not private profits.